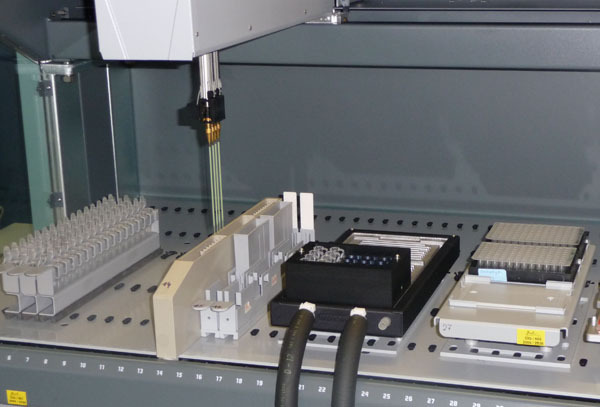 The facility realises routine PCR with the use of a robot (Freedom EVO from Tecan) for series of 20 or more samples. Screens made in routine are available on request. The facility is able to transfer manual screen to robot analyse (primers testing, DNA extraction, amplification parameters…) or to optimize a new screen (for example moving from Southern to PCR analysis, establishment of a new protocol…). Results of the genotyping are entered by the facility into the Pyrat system database, co-managed with the animal facility. Samples are conserved 6 months in the laboratory after genotyping. Prices of analyses are fixed by the CIG direction and bills are established for each research group.